PVMBG reported that white plumes rose at most 50 m above Tangkubanparahu's Ratu Crater during November-December 2013. Deformation data showed changes and seismicity increased. On 31 December the Alert Level was raised to 2 (on a scale of 1-4). Residents and tourists were warned not approach the crater within a radius of 1.5 km. Tangkubanparahu (Tankuban Parahu) erupted multiple times during the interval of reporting discussed here. That interval extends from February 2013 through December 2014; however, Bulletin editors were unable to find ongoing reports of activity between 1 January 2014 and 1 June 2015. The eruptions were from Ratu crater and of quite small size (highest reported plumes only rose to 100 m tall). The vent grew in size as a result of these eruptions, reaching in early March 2013 a diameter of 20 m. The small eruptions contained minor ash but did not emit a dome or lava flows and accordingly did not lead to thermal anomalies detected via the MODVOLC satellite-based infrared detection system (and this is the case going back to at least the year 2010). In past reports during the past few decades, Tangkubanparahu has largely been quiet but with occasional tremor and volcanic earthquakes (eg., late August-October 2002, 12-19 April 2005, and August-September 2012; BGVN 27:09, 28:08, 30:12, and 37:11). The location of the volcano in Java is shown in figure 1 of BGVN 37:11. According to the Center of Volcanology and Geological Hazard Mitigation (CVGHM, also known as Pusat Vulkanologi dan Mitigasi Bencana Geologi, PVMBG), tremor increased on 21 February 2013 and diffuse ash emissions rose from Ratu Crater. Based on the seismicity, visual observations, and temperature increases of the land around the crater, CVGHM raised the Alert Level to 2 (on a scale of 1-4) and visitors were reminded not to approach the crater within a radius of 1.5 km. CVGHM reported that phreatic eruptions from Tangkubanparahu's Ratu Crater occurred on 28 February and during 4-6 March 2013, and generated ash plumes that rose up to 100 m above the crater. A news report (kompas.com) quoted CVGHM as stating that the March explosion was much stronger than the one on 21 February 2013. The news report said that the 6 March eruption lasted for ~8 minutes. The Jakarta Post also said that the 6 March eruption lasted ~8 minutes and ejected ash about 30 m above Ratu Crater. The Jakarta Post reported that on 18 March, CVGHM lowered the Alert Level to 1 (normal) because of a significant decrease in the tremor frequency. The article also quoted CVGHM as stating that deformation, using a Global Positioning System (GPS) and Electronic Distance Measurement (EDM), found at one or more stations a decline in relative elevation from 6.84 cm to a few millimeters by 18 March. Deflation was again detected from 24 February through early March 2013, but was stable during 7-14 March 2013. According to CVGHM, sulfur dioxide emissions increased to 5.3 metric tons per day (t/d) on 24 February 2013, decreased through 3 March 2013 to 2.1 t/d, and then increased again during 5-9 March 2013 to 4.9 t/d. CVGHM speculated that the increase was due to an enlargement of the eruptive vent, which had grown to a diameter of 20 m.
Gas emissions decreased abruptly on 10 March 2013 to 2.1 t/d and emission sounds stopped. On 4 March 2013, a new solfatara vent opened, but SO2 levels could not be measured on that day because of weather conditions. On 5 October 2013, a phreatic eruption occurred, causing CVHGM to raise the Alert Level to 2. Figure 2 is an image of Ratu Crater. Figure 2. Photo of Tangkubanparahu's Ratu crater taken (or posted?) in June 2014. Ratu crater is the currently active crater and one of two large craters on the volcano; it is about 1 km in diameter and has a depth of about 400 m. CVGHM reporting notes that, overall, the volcano hosts 9 craters. Image courtesy of Marietha S as posted on Tripadvisor.com. CVGHM reported that during November-December 2014 white plumes rose up to 50 m above Ratu Crater. Deformation occurred and seismicity increased. On 31 December the Alert level rose to 2 (on a scale of 1-4), cautioning people to remain at least 1.5 km from the crater. Seismicity. The CVGHM report discussing late 2014 features a plot of seismic data during December 2012 through December 2014, which the authors termed significant, the chief observation prompting a rise in alert level (to II). Tremor was most prominent beginning mid-2013 to early March 2014. Both low-frequency and hybrid earthquakes were nearly absent except during a short sequence in late 2014 (each with over 100 earthquakes; see table below). Type-B earthquakes were common at levels from a few to ten events per 20-day interval, and like the low-frequency and hybrid earthquakes, peaked in latest December 2014 (~50 type-B events). Type-A earthquakes showed little or no tendency to cluster and remained below 5 events per 20 day interval and on many days they were absent. Table 3 indicates the types and frequencies of seismic activity at Tangkubanparahu during selected, mostly active periods during 2013. Shallow volcanic earthquakes predominated during many of these periods. The number of tremor was high during the first week of March 2013, but significantly declined thereafter. The 25 September 2013-5 October 2013 period contained somewhat elevated seismicity, yet apparently lacked significant eruptive activity. Note the emergence of 513 low-frequency earthquakes during 1-31 December 2014 (lower right). That data is in the same year-end report (issued in early 2014 and written in Indonesian) and is also noteworthy in terms of the plot of distance (EDM) data to various reflectors around the crater during the entire year of 2013. Table 3. A compilation of earthquake counts and tremor durations recorded at Tangkubanparahu for selected periods during 2012-2014. Definitions: -- signifies no data (presumably no episodes); VA, volcanic type-A earthquake; VB, type B (shallow volcanic earthquake); TJ, deep tectonic earthquake; BQ, an earthquake indicative of emissions; and TL, local tectonic earthquake. Courtesy of CVGHM. Information Contacts: Center of Volcanology and Geological Hazard Mitigation (CVGHM) (URL: http:proxy.vsi.esdm.go.id/index.php); kompas.com (URL: kompas.com); and The Jakarta Post (URL: http://www.thejakartapost.com/). PVMBG reported a phreatic eruption from Tangkubanparahu at 0621 on 5 October. The Alert Level was raised to 2 (on a scale of 1-4). CVGHM reported that phreatic eruptions from Tangkubanparahu's Ratu Crater occurred on 28 February and during 4-6 March, and generated ash plumes that rose up to 100 m above the crater. Sulfur dioxide emissions increased to a high level on 24 February and then decreased through 3 March. Sulfur dioxide emissions again increased during 5-9 March; CVGHM speculated that the increase was due to an enlargement of the eruptive vent, which had grown to a diameter of 20 m. Gas emissions decreased abruptly on 10 March and emission sounds stopped. Seismicity had significantly increased on 22 February, marked by a growing number of daily events. A significant decrease was detected on 9 March. Deflation was detected from 24 February through early March, but was then stable during 7-14 March. On 18 March the Alert Level was lowered to 1 (on a scale of 1-4). According to news articles, an eruption from Tangkubanparahu on 4 March produced an ash plume that rose 500 m above the crater. An eight-minute-long eruption at 0559 on 7 March ejected ash 30 m above Ratu Crater. CVGHM reported that on 21 February tremor increased at Tangkubanparahu and diffuse ash emissions rose from Ratu Crater. Based on the seismicity, visual observations, and temperature increases of the land around the crater, the Alert Level was raised to 2 (on a scale of 1-4) and visitors were reminded not to approach the crater within a radius of 1.5 km. CVGHM reported that during 23 August-21 September shallow volcanic earthquakes continued to be recorded at Tangkubanparahu but were less frequent. Other types of seismic signals also decreased. Based on seismicity, visual observations, deformation data, gas measurements, and soil and crater lake water temperatures, the Alert Level was lowered to 1 (on a scale of 1-4) on 21 September. CVGHM reported that seismicity at Tangkubanparahu had increased significantly on 13 August, then again on 23 August; seismicity fluctuated and remained elevated through 6 September. Earthquakes were located 0.5-4 km beneath Ratu Crater and in an area W at depths of 4-12 km. Soil temperatures at Ratu Crater showed an increasing trend on 31 August, but had gradually declined by 5 September. Sulfur dioxide gas emissions were high in an area NW of the crater, causing CVGHM to remind visitors not to approach the crater within a 1.5-km radius. Based on seismicity, visual observations, gas measurements, and crater lake water temperatures through 7 September, the Alert Level remained at 2 (on a scale of 1-4). CVGHM reported that seismicity at Tangkubanparahu increased significantly on 13 August; earthquakes continued to be recorded through 23 August. The Alert Level was raised to 2 (on a scale of 1-4). Visitors and residents were prohibited from going within a 1.5-km radius of the active crater. At Tangkubanparahu "white thin smoke" was emitted from Upas Baru crater and Ratu crater on 14 April, and from Upas Baru crater on 15 April. On 14 and 15 April shallow and deep volcanic earthquakes were recorded. During this time visitors were banned from the volcano. On 19 April the Alert Level was reduced from 3 to 2 (on a scale of 1-4) and the volcano was opened to the public, but access was restricted around Ratu crater and not permitted at the other craters. On 13 April at 0700 DVGHM raised the Alert Level at Tangkubanparahu to 2 (on a scale of 1-4) due to an increase in seismicity at the volcano. In addition to an increase in seismicity in comparison to the previous day, there was a strong scent of sulfur near Ratu crater. On the 13th at 1300 the Alert Level was raised to 3 due to a further increase in seismicity and the occurrence of tremor. No ash plume was observed. Visitors were banned from the summit and crater area. On 2 September VSI raised the Alert Level at Tangkubanparahu from 1 to 2 (on a scale of 1-4). The number of daily earthquakes had been increasing for 2 weeks and the temperatures of Domas and Ratu craters were 2-4°C higher than normal. There were no surface changes at the volcano, but several animals from the forest near Ratu crater were found dead in the crater. Tangkubanparahu has shown increased seismicity, thermal activity, and inflation during the past several months. A VSI seismograph recorded as many as seven shallow volcanic tremors/day in early June, 19/day by early August and 25/day the last week in August. At the beginning of September, seismicity increased sharply from an average of 14 to 60-74 events per day and by the middle of the month reached a daily average of 106-110. Epicenters were in the vicinity of Baru fumarolic field, on the W wall of Crater 3. No deep volcanic earthquakes have been detected. A telemetering seismograph (obtained through the VSI-USGS cooperative program) permitted monitoring from Bandung, 30 km S of the volcano. Little change in surface activity was observed until September. Three fumarole fields (Baru, Ratu, and Upas) were monitored, with highest temperatures recorded at Baru, increasing to 98°C from an average of 94°C. On 13 September, a pair of white steam columns rose from Baru field for about 20 minutes each, reaching heights of 100-150 m. SO2 emission measured by COSPEC increased from 70 t/d in August to 80 t/d in September. Since July, dry tilt measurements have shown a consistent inflation centered on Baru fumarole field totaling about 20 µrad. Civil authorities warned of the volcanic hazard and the National Park has issued an alert to tourists. Within a 3-km danger zone, camping and auto parking were forbidden. Seismicity continued to increase through mid-October but no surface changes have been noted. Tectonic earthquakes and both A-and B-type microtremors were recorded. A-type events occurred irregularly, usually at 1-3 per day, but as many as five were detected on several days. B-type earthquakes increased substantially, as shown in table 1. Table 1. Number of B-type events/day at Tangkubanparahu, May to mid-October 1983. Ground deformation did not show regular changes. From 10 to 25 mm of irregular inflation and deflation were detected but their significance is doubtful. Fumarole temperatures remained stable at 96°C in the three fumarole fields (Baru, Ratu, and Upas). The previously declared forbidden zone of 3-km-radius remained in effect. Temperatures in Kawah Baru, a small vent on the W side of the summit crater, active during the 1896 eruption, rose steadily from 90 to 140°C in the two weeks prior to 9 December. No changes have been detected in the volcano's continuing low-level background seismicity. Information Contacts: T. Casadevall and L. Pardyanto, VSI. 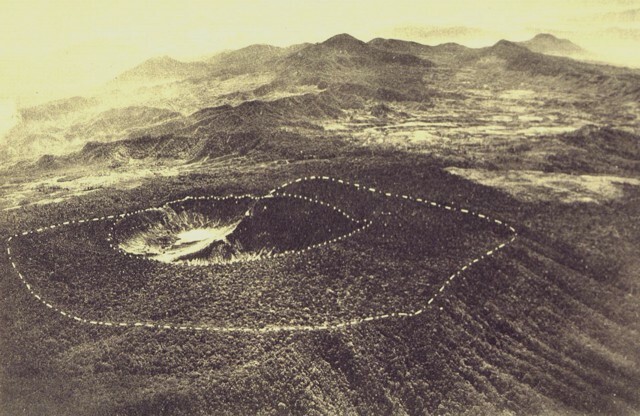 [Minor steam explosions were reported from Kawah Baru crater on 15 November 1985. The explosions were described as essentially phreatic, producing a 200-m-high eruption cloud. There was no mention of tephra ejection. After this event, temperatures in the Kawah Baru solfatara field increased from 95 to 168°C]. Information Contacts: A. Sudradjat, Kaswanda, and Tulus, VSI (as reported in BVE, no. 25, March 1988). Fumarole temperatures at Kawah Baru continued to climb through December, reaching a maximum of 171°C on 31 December. In January, temperatures have gradually declined to 148°C as of the 11th. No seismicity was recorded. Information Contacts: Suparto S. and T. Casadevall, VSI. Fumaroles of the Kawah Baru field continued to have elevated temperatures that ranged from 152 to 158°C during March. Seismic tremor was recorded on the seismometer at Kawah Ratu on 17 March, from about 0900 until 2400. Tremor was again recorded briefly on 18 and 19 March. "During March the complete EDM network was reoccupied for the first time since 1983. The results of the survey are consistent with long term inflation of Tangkubanparahu as detected by spirit level tilt measurements from 1981 through January 1986. The center of inflation . . . is located at Kawah Upas, ~500 m E of the Kawah Baru fumaroles. The epicentral area of the late 1983 seismic activity was in the S half of Kawah Upas, approximately coincident with the center of uplift determined from tilt measurements." Information Contacts: Kaswanda, H. Said, A. Sudradjat, and T. Casadevall, VSI. Fumarole temperatures at Kawah Baru crater remained elevated, reaching 161°C during April, but no additional seismic tremor was observed during the month. No additional seismic activity was reported [in May], but fumarole temperatures remained elevated. Information Contacts: A. Sudradjat, L. Pardyanto, and T. Casadevall, VSI. Fumaroles in the W crater continued to have elevated temperatures. The ephemeral lake in the E crater (Kawah Ecoma) has dried up, most likely the result of the end of the wet season. "The only significant changes . . . during September were an increase in fumarole temperatures. As of 20 September, fumarole temperatures in Kawah Ratu crater had risen from their normal 97 to ~112°C, and had increased further in Kawah Baru crater to 189°C (from 161°C in April). No changes in seismicity or other activity were observed." Information Contacts: L. Pardyanto, Olas, Kaswanda, Suratman, A. Sudradjat, and T. Casadevall, VSI. Seismicity began to increase on 28 September. B-type earthquakes were continuing in early December, at rates of 47-204/week. None of the vents on the crater floor showed signs of unusual activity. Visitors are still advised to avoid descending to the bottom of the crater. The Volcanological Survey of Indonesia (VSI) reported that Tangkubanparahu reactivated during late August 2002. On 2 September the Alert Level was raised to 2, following an elevated number of earthquakes that were registered during the previous two weeks. The temperatures of Domas and Ratu craters increased ~2-4°C; Domas crater was at 74-93°C and Ratu crater at 95-100°C. No visual changes accompanied the temperature increase inside the craters, but several animals were found dead in Ratu crater. Seismicity totals for the week of 26 August-1 September were three deep-volcanic (A-type), 172 shallow-volcanic (B-type), and 12 tectonic earthquakes. During 2-8 September, four A-type, 224 B-type, and two tectonic earthquakes were registered. In August and September 2002 Tankubanparahu showed its first elevated seismicity since 1992 (BGVN 27:09). This activity continued in October of 2002. The volcano is at Alert Level 2. From September through 6 October, volcanic events dominated seismicity, particularly during the week of 16-22 September, when there were 331 shallow volcanic [B-type] events. Crater fumarole temperatures of 92-95°C were recorded at Domas and Ratu craters; the hotspring temperature at Ciater was 47°C. H2S concentrations were above detections limits, ranging from 80 to more than 100 ppm at Ratu; more than 80 ppm H2S was also recorded at Jagal. A "thin white ash plume" was observed to rise 2.5 m, and a whizzing sound could be heard 50 m away. A strong sulfur smell and sulfur sublimation were noted. Between 7 and 13 October, volcanic events again dominated seismic activity, but numbers were lower than the previous week, with 151 B-type events, down from 199, and four A-type events, down from five. Tectonic activity occurred at the same rate as the previous week, with 21 events. The following week volcanic activity again dropped, with 57 shallow volcanic (B-type) events. However, deep volcanic (A-type) events increased slightly, to 15. Observations during the week included a "white-thin ash plume" to 2 m and medium-strong gas pressure. A strong sulfur smell and yellow sublimation were also noted. The fumarole temperature at Ratu crater was 95°C. Shallow volcanic earthquakes increased through the week of 21-27 October, with 123 events. Deep volcanic events dropped to 7, and tectonic activity again remained stable, with 19 events. On 25 October Upas crater was measured at 44°C; a "white-thin ash plume" was only noted to rise 0.5-1 m, and the sulfur smell was weak. Information Contacts: Dali Ahmad, Volcanological Survey of Indonesia (VSI), Jalan Diponegoro No. 57, Bandung 40122, Indonesia (URL: http://www.vsi. esdm.go.id/). Typically quiet, Tangkubanparahu went into a period of unrest from 12 to 19 April 2005. After that, it became relatively quiet again. The reports during this period did not in general cover an entire day, but rather only 6 or 12 hours. The reports chiefly discussed a seismic crisis and elevated SO2 fluxes. A brief review for this period follows. Seismic activity increased dramatically beginning on 12 April 2005. Normally about two volcanic eruptions occurred daily. Volcanic earthquakes recorded on 12 April consisted of five deep (type-A events with peak-to-peak amplitudes of 7-24 mm) and 56 shallow (type-B events with peak-to-peak amplitudes of 3-10 mm), with numbers increasing throughout the day. About 8 hours of tremor on 13 April, a swarm of earthquakes took place, of which 111 were deep type-A events and 181 were shallow type-B events. The peak of the activity occurred on 14 April, when the deep events numbered 108 and the shallow events numbered 327. A located hypocenter was 1.6-1.9 km beneath the Domas crater. Based on the above seismic data, the hazard status for the volcano was raised on 13 April 2005 at 0825 to Level 2, and then at 1300 to Level 3. The SO2 measurement around Domas crater yielded about 10 metric tons/day (t/d) on 14 April. It was less than 2 t/d on 18 April. The hazard status of the volcano was downgraded to Level 2 on 19 April 2005 at 1200, and the area was re-opened to the public. The other craters (Upas, Domas, Baru, Jarian) remained closed to the public. Information Contacts: Directorate of Volcanology and Geological Hazard Mitigation (DVGHM), Jalan Diponegoro 57, Bandung 40122, Indonesia (URL: http://www.vsi.esdm.go.id/). Our most recent report on Tangkubanparahu (also known as Tangkuban Perahu) described increased seismicity during April 2005, consisting primarily of volcanic earthquakes and tremor (BGVN 30:12). This report describes elevated seismicity during August-September 2012. The Center of Volcanology and Geological Hazard Mitigation (CVGHM) notes that at least three magmatic eruptions and four phreatic eruptions had occurred at Ratu Crater, the most active vent, during 1829-1994. Ratu Crater is about 30 km N of Bandung in W Java. Figure 1 indicates the general location of the volcano. Figure 1. Sketch maps of Indonesia and W Java indicating the location of Tangkubanparahu (Tangkuban Perahu). Courtesy of Kartadinata and others (2002). The next report we received on Tangkubanparahu described activity starting in August 2012. According to CVGHM, the frequency of earthquakes and tremor increased on both 13 and 23 August. Around this time, hot blasts of sulfuric gases, white in color, rose from Ratu Crater to heights of 50-400 m above the crater's floor. CVGHM reported that the temperature of emissions from Ratu Crater on 24 August was 246°C, compared to a measurement of 111°C on 18 August. On 23 August, the Alert Level was raised to 2 (on a scale of 1-4), and visitors and residents were prohibited within a 1.5-km radius of the active crater. Seismic activity declined on 23 August; shallow volcanic earthquakes continued to be recorded but were less frequent through 21 September (table 2 provides data through 20 September). Hypocenters of volcanic tremors during this period were located beneath an area W of Ratu Crater at depths of 4-12 km. Soil temperatures at Ratu Crater were 30.5°C on 26 August, then were 35°C on 30 August, but then gradually declined during 31 August-21 September to ~34°C. Table 2. Type and occurrence of earthquakes at Tangkubanparahu between 24 August and 20 September 2012. Courtesy of CVGHM. Between 5-11 September, sulfur dioxide gas emissions were elevated in an area NW of the crater associated with the plume, but in the latter part of September 2012 concentrations averaged4in Ratu Crater increased from 0.11 in December 2011 to ~4 on 24 August 2012 and remained at that level on 11 September 2012, which suggested to CVGHM that hot fluid was rising to the surface. Based on seismicity, visual observations, deformation data, gas measurements, and soil and crater lake water temperatures, the Alert Level was lowered to 1 on 21 September 2012. The eruptive history of Tangkubanparahu was described by Kartadinata and others (2002). Reference. Kartadinata, M., Okuno, M., Nakamura, T., and Kobayashi, T., 2002, Eruptive history of Tangkuban Perahu volcano, West Java, Indonesia: A preliminary report, Journal of Geography, v. 111, issue 3, p. 404-409. Information Contacts: Center of Volcanology and Geological Hazard Mitigation (CVGHM), Jalan Diponegoro 57, Bandung 40122, Indonesia (URL: http://www.vsi.esdm.go.id/). Tangkubanparahu (also known as Tangkuban Perahu) is a broad shield-like stratovolcano overlooking Indonesia's former capital city of Bandung. The volcano was constructed within the 6 x 8 km Pleistocene Sunda caldera, which formed about 190,000 years ago. The volcano's low profile is the subject of legends referring to the mountain of the "upturned boat." The rim of Sunda caldera forms a prominent ridge on the western side; elsewhere the caldera rim is largely buried by deposits of Tangkubanparahu volcano. The dominantly small phreatic historical eruptions recorded since the 19th century have originated from several nested craters within an elliptical 1 x 1.5 km summit depression. Dvorak J, Matahelumual J, Okamura A T, Said H, Casadevall T J, Mulyadi D, 1990. Recent uplift and hydrothermal activity at Tangkuban Parahu volcano, west Java, Indonesia. Bull Volcanol, 53: 20-28. Kartadinata M N, Okuno M, Nakamura T, Kobayashi T, 2002. Eruptive history of Tangkuban Perahu volcano, west Java, Indonesia: a preliminary report. J Geog (Japan), 113: 404-409. Soetoyo, Hadisantono R D, 1992. Geologic map of Tangkubanparahu volcano (Sunda Complex volcano), West Java. Volc Surv Indonesia, 1:50,000 scale. van Bemmelen R W, 1941. Bulletin of the East Indian Volcanology Survey for the year 1941. East Indian Volc Surv Bull, 95-98: 1-110.
van Bemmelen R W, 1971. Four volcanic outbursts that influenced human history. Toba, Sunda, Merapi, and Thera. In: Kaloyeropoyloy A (ed) Acta 1st Internatl Sci Cong on the Volcano of Thera, Athens: Arch Serv Greece, p 5-50. Volcanological Survey of Indonesia, 1984. Tangkubanparahu excursion. Unpublished manuscript, 14 p.
There is data available for 21 Holocene eruptive periods. Remarks: Possible causes for this uplift are increased pressure within a very shallow magma body or heating and expansion of a confined aquifier. Reference List: Dvorak et al. 1990. There is no Emissions History data available for Tangkubanparahu. The broad, shield-like stratovolcano Tangkubanparahu, known in local legend as the mountain of the "upturned boat," dominates the skyline immediately north of Indonesia's former capital city of Bandung. 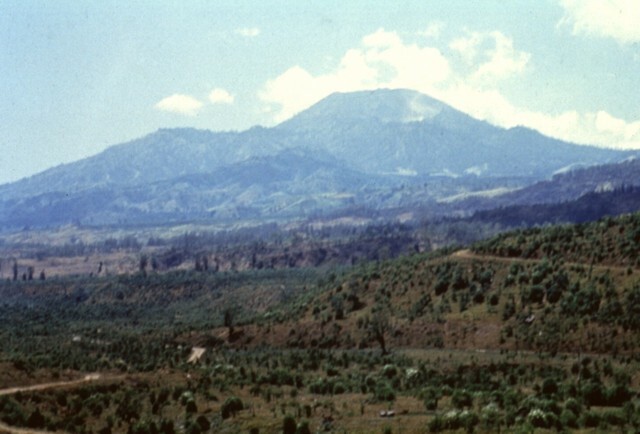 The volcano is truncated by the 6 x 8 km Pleistocene Sunda caldera. A series of nine overlapping craters forming a 1 x 1.5 km wide elliptical depression at the summit of a post-caldera cone are a popular tourist destination. Only minor phreatic eruptions have occurred in historical time. Photo by Tom Casadevall, 1987 (U.S. Geological Survey). 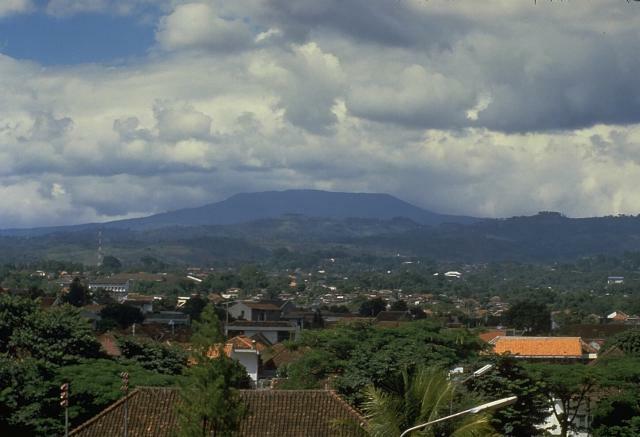 Tangkubanparahu stratovolcano, seen here from the east, forms the most prominent peak north of the city of Bandung. The 2084-m-high summit of the volcano overlooks a broad crater complex, whose southern rim forms the flat ridge left of the summit. Pyroclastic-flow deposits accompanying formation of a large caldera that preceded the construction of Tangkubanparahu volcano blanket the area around Bandung. The broad summit of Tangkubanparahu volcano is seen in this aerial view from the NW. The dashed line outlines an outer crater inside which a younger crater complex (dotted line) was constructed. Frequent phreatic eruptions have occurred during historical time from the central crater complex. Bukit Tunggul, an older volcano, forms the peak on the center horizon. There are no samples for Tangkubanparahu in the Smithsonian's NMNH Department of Mineral Sciences Rock and Ore collection. Large Eruptions of Tangkubanparahu Information about large Quaternary eruptions (VEI >= 4) is cataloged in the Large Magnitude Explosive Volcanic Eruptions (LaMEVE) database of the Volcano Global Risk Identification and Analysis Project (VOGRIPA).